If you've just embarked on a fitness regimen and you're wondering why the inches aren't melting away, it could be your diet that is to blame. How many times have you trained hard only to give in to that high-fat meal and dessert? You've earned it, right? The fact is that it is impossible to out-train a bad diet. Not only is it impossible, but it is also soul-destroying when you don't see the results you expect. If you eat more calories than you burn off during a workout, you'll only sabotage all the hard work you put in. You can't transform your body if you are regularly allowing your cravings to get the better of you. If you consume excess calories, you have to find ways to counterbalance them. That said, you can't train hard on just 700 calories a day and expect rapid results either. 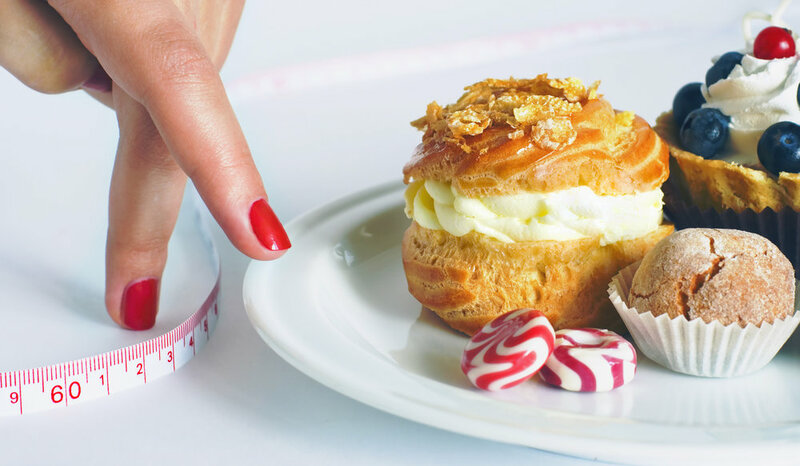 Taking in too few calories can be bad for your health. It's all about getting the balance just right. If you're finding that bad habits are getting in the way of getting the body you want, a food journal could keep you on track. By writing down every single thing that passes your lips, you can get a good idea of your typical daily calorie consumption. Once you have that figure as a starting point, you can start to choose healthier, leaner food options and keep within your calorie allowance. Think about the food you are putting into your body and its nutritional and calorie content. Trade in that high-caffeine coffee and sugary donut for a bowl of nourishing oatmeal. Sure, the oatmeal has calories, but you'll be getting those calories from complex carbs instead of sugar and fat. When you're training, you need to fuel your body in the right way. That means steering clear of refined foods like enriched flour, white bread and sugar. These have all been highly processed and contain very little nutritional value. Instead, give your body and your workout a boost by fueling up on complex carbs such as whole grains, oatmeal, sweet potatoes, fruits, vegetables & legumes. Try to plan in your daily carbs so that 30 percent surround your workout. That is, eat the 30 percent before and after your workout. This buffer zone not only fuels your body for the hard work ahead but also helps your muscles to recover post workout. Also, add protein for muscle recovery, but aim to keep fats to a minimum. Many people make the mistake of thinking that a diet low in calories and carbs is the best approach to weight loss and fitness. The sad truth is they are doing more harm than good. Your muscles need fuel, and that fuel needs to come from a healthy and nutritious diet. If you are following a diet low in calories and putting yourself through punishing workouts, your body could start using muscle mass for energy. This can have a very damaging effect on muscle tissue, while your body fat stays unaffected. Instead, keep yourself energized and your muscles primed with a diet rich in complex carbs and proteins. Everybody is different. Your metabolism may be faster or slower than the next person, or you may lose weight at a faster or slower rate. Be competitive, but don't compare. Be sensible, but don't beat yourself up if you fall off the wagon from time to time. Getting that fit, healthy and sculpted body is all about finding the right balance and choosing a diet that helps you to get where you want to be. I’m here to share with you my two favorite fitness apps to help you with your strength training, cardio, circuits and nutrition. Since we always have our phones with us, it’s a great way to keep track of our fitness journeys and help us achieve our goals each step of the way! This is my favorite app when it comes to logging my workout routines at the gym. Fitlist can be used to track any type of exercise you want. From weightlifting and strength training to cardio, circuits and more! You can create a workout by choosing from the 1000 different exercises it has listed and if it’s not listed, you can simply add it yourself! It’s really easy and simple to use which is why I love it so much. You can save workouts and use them for future workouts too! MyFitnessApp is one of my best friends. It’s a free app which allows you to track what you eat every day. Since I am a big believer of Flexible Dieting, this is my go-to app to keep me in line with reaching my macros every day. It’s very user friendly and you can search for any possible food you can think of, even if you are dining at a restaurant, chances are you’ll find it in MyFitnessPal! Even if you don’t count macros, it’s still a fantastic app to help you become more aware of your eating habits and since it syncs up to a lot of fitness apps, it can also show you just how much exercise it takes to burn off the food you eat. My one suggestion when it comes to using this app is, do not listen to the set calories it gives you based on the goals you input into the app. Most likely, it is telling you to eat WAY less than you really should be. If you need help figuring out how much you should be eating, find a coach who can help you or feel free to contact me via my “contact page” and I’ll be happy to assist you!